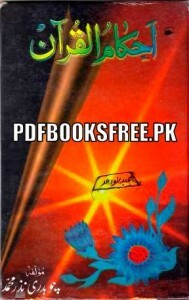 Ahkam ul Quran book authored by Chaudhry Nazar Muhammad. We all know that death is certain for all. We all believe that the Qur’an is revealed by Allah Ta’ala. This book Ahkam ul Quran is a research work which explain Quranic orders and laws as well discussed various chapters and laws and orders of the Holy Quran in Urdu language. Virtues of the Noble Quran and consideration upon the universe, creation of human and death, the details of faith, the purpose of human life, Resalat, source of Hidayah, preaching of Deen, efforts and struggle for truth, polytheism (the belief in or worship of more than one god) , moral and social diseases, the character of a Kafir and our behavior, repentance (Tauba), signs of the righteous persons, characterizations, the reality of worldly wealth, economics, beauty of society, social life and relationships, testimony and justice, Education and Training, Worship, Family laws, Inheritance, rulings of Pardah, Zina and Qazaf, Retaliation and Hudood, nations rise and fall, Jihad, Defense and politics. Visit the following links to read online and free download Ahkam ul Quran complete book in Pdf format for offline reading and references.